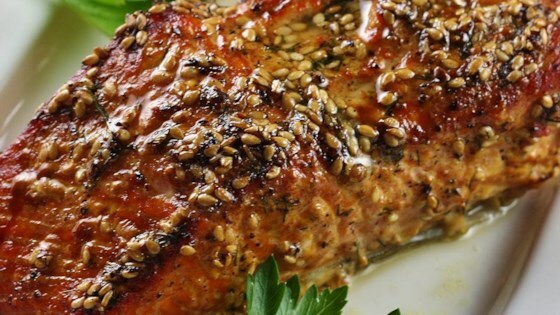 "Cedar plank salmon can be baked in the oven or barbequed on the grill with this easy recipe." Soak the cedar plank in water for at least 2 hours and up to 12. Preheat the oven to 325 degrees F (165 degrees C), or see Footnote for grilling instructions. Place the salmon on the plank, skin-side down. In a small bowl, stir together the sesame oil, brown sugar, dill weed and sesame seeds. Stir in just enough water to make it liquid. Season with pepper and soy sauce if desired. Spoon the mixture over the salmon so it is fully coated. Watch how to smoke salmon on a cedar plank! Meh. It was decent at best. Needs more flavors. I marinated the fish for an hour and it still didn't pick up enough flavor. Maybe fresh dill next time? EXCELLENT!! This is the perfect recipe as shown - no changes! I have made this recipe so many times, I've lost count. It is my families favorite Salmon recipe. I have never made it on a plank, however. I just grill it on a piece of foil. A real treat!! !